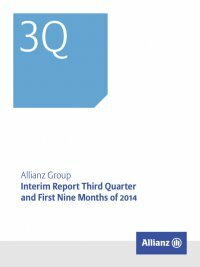 103Interim Report Third Quarter and First Nine Months of 2014 Allianz Group B Condensed Consolidated Interim Financial Statements 49 Consolidated Balance Sheets 50 Consolidated Income Statements 51 Consolidated Statements of Comprehensive Income 52 Consolidated Statements of Changes in Equity 53 Consolidated Statements of Cash Flows 55 Notes Financial assets for unit-linked contracts For level 2, the fair value is determined using the market or the income approach. For the income approach, primary observable inputs include yield curves observable at commonly quoted intervals. For level 3, the fair value is mainly determined based on the net asset value. Financialliabilitiesforunit-linkedcontractsarevaluedbasedon their corresponding assets. Derivative financial instruments and firm commitments included in other assets The fair value of the derivatives is mainly determined based on the income approach using present value techniques. Primary inputs include yield curves observable at commonly quoted intervals. The derivatives are mainly used for hedging purposes. Certain derivatives are priced by Bloomberg functions, such as Black-Scholes Option Pricing or the swap manager tool. Financial liabilities held for trading – Derivative financial instruments For level 2, the fair value is mainly determined using the income approach. Valuation techniques applied for the income approach mainly include discounted cash flow models as well as the Black- Scholes-Merton model. Main observable input parameters include volatilities, yield curves observable at commonly quoted intervals and credit spreads observable in the market. For level 3, the fair value is mainly determined based on the income approach using deter- ministic discounted cash flow models. A significant proportion of derivative liabilities represent derivatives embedded in certain life insurance and annuity contracts. Significant non-market observable input parameters include mortality rates and surrender rates. Financial liabilities held for trading – Other trading liabilities The fair value is mainly determined based on the income approach using present value techniques. Primary inputs comprise swap curves, share prices and dividend estimates. Derivative financial instruments and firm commitments included in other liabilities For level 2, the fair value is mainly determined using the income approach. Primary inputs include interest rates and yield curves observable at commonly quoted intervals. Financial liabilities for puttable equity instruments Financial liabilities for puttable equity instruments are generally required to be recorded at the redemption amount with changes ­recognized in income. For level 2, the fair value is mainly determined based on the market approach and the income approach. Significant transfers of financial instruments carried at fair value In general, financial assets and liabilities are transferred from level 1 to level 2 when liquidity, trade frequency and activity are no longer indicative of an active market. Conversely, the same policy applies for transfers from level 2 to level 1. Significant level 3 portfolios – Narrative description and sensitivity analysis Available-for-sale investments – Equity securities Equity securities within available-for-sale investments classified as level 3 mainly comprise private equity fund investments as well as alternative investments of the ­Allianz Group and are in most cases delivered as net asset values by the fund managers (€ 5.1 bn). The net asset values are calculated using material, non-public information abouttherespectiveprivateequitycompanies.The­AllianzGrouphas only limited insight into the specific inputs used by the fund man­ agers and hence a narrative sensitivity analysis is not applicable. The fund’s asset manager generally prices the underlying single portfolio companies in line with the International Private Equity and Venture Capital Valuation (IPEV) guidelines using discounted cash flow (income approach) or multiple methods (market approach). For certain investments, the invested capital is considered to be a rea­ sonable proxy for the fair value. In these cases, sensitivity analyses are also not applicable.